We do! There are four I can think of...two in my neighborhood and two at the elementary schools. Mostly we get rid of kid-books we age out of (and some of those that I can stand but others like....Berenstine bears.) I also put copies of my own books in there. And juicy novels that have sat on my shelves at least one move and haven't been read. Or literature that, oy, I am not going to read William Burroughs again. And no one can make me!! There's 2 within a block of one another in my area. Both are well-maintained and clearly loved. The only worry is mold, so the books tend to be more wore, but there are always treasures there. Honestly, I tend to hoard works that really impacted me. But as I age and find myself minimizing my possessions, I also am finding I'm more willing to part with those that touched me. That said, I don't believe in passing on the junk. Maybe mine would be a middle ground? This is such a lovely concept and I would love to be a part of it. U just read "The Good Earth" by Pearl S Buck and it's an awesome book. No doubt it's a classic. But I can still pass it on to someone who wishes to read. Hopping over from the #MicroBlogMondays linky! But our local YMCA has book sales through the year. You donate your books (I tend to go with my beloveds that I've consumed thoroughly) and buy other people's at a low low price. I love perusing, wondering about the people behind the books. I haven't read a good book lately. Tell me if you find one I should pick up. We just got some of these but I'm not actually sure where they are right now. I would give away books that I don't plan to read again. I might have enjoyed them at the time but I'm not going to read them over and over. Technically the only books I want to keep are those I re-read, but i'm not that strict in reality. I currently have a pile of books I would like out of the house, but not sure where they should go. I have a bunch of 18th century plays from when I studied that time period in university lol. I feel bad about recycling them but realistically who is going to want to read or buy them? I don't particularly want to drive all the way to the university to try to sell them, and I doubt they'd take them anyway. Some of the novels that are more mainstream I'll try to sell to a used bookstore, I think. I think I would only give a little library popular fiction or a popular non fiction book because it wouldn't be appropriate to put some obscure thing in there, whether or not it's something I enjoy. We don't have a little free library like that, but I think that I would (with guilt) give away books I don't care about. I like to keep my books. In fact, if I love a book enough, I buy a paper version and an e-book version so I can always have the book with me. I just like knowing it's in my pocket. 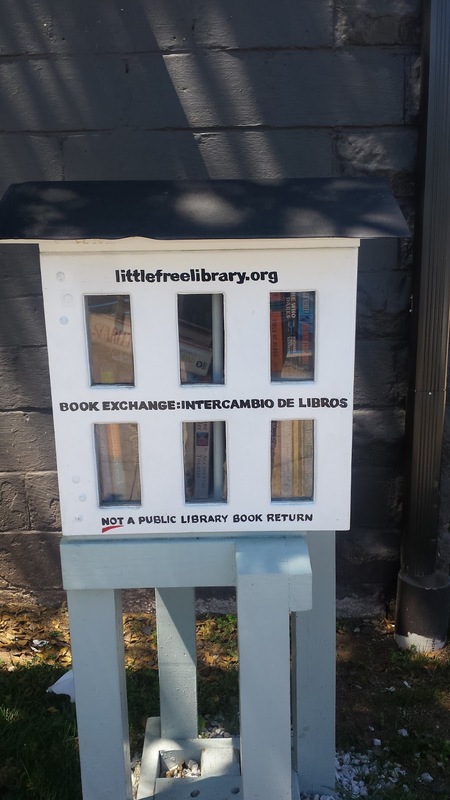 I think you (or someone) suggested a Little Free Library as a place where I could take the books from my recent downsizing project. I didn't think 25 cartons of books would fit ;) but if I ever had a smaller quantity of books to get rid of, I might consider this. I checked at the time & while there is not one in my specific town, there appear to be a couple within 10 km of me. I find it difficult to give away things that mean a lot to me. I got rid of a LOT of books, including some that I initially thought I couldn't give up (sometimes if I sit with the idea, I find I can do it after all...!) -- but I am still hanging on to some of my longtime favourites (for now, anyway) -- including an entire Rubbermaid tub full of books by one of my favourite authors since I was a teenager (Barbara Michaels/Elizabeth Peters). My sister got me e-versions of just about all of her books, but I am still finding it hard to let go of the paper versions, painstakingly acquired & loved over many years (& one of them personally autographed). As for stuff other than books, it was hard to get rid of my stereo & LP collection, but giving it to my nephew (vs the Sally Ann) made it easier. I take bags full of discarded clothing to the dropoff box regularly. I find it easier to get rid of clothes than books ;) and go through my closet fairly regularly, but even then, I probably hang onto things I haven't worn in awhile longer than I should, just because of the memories attached.